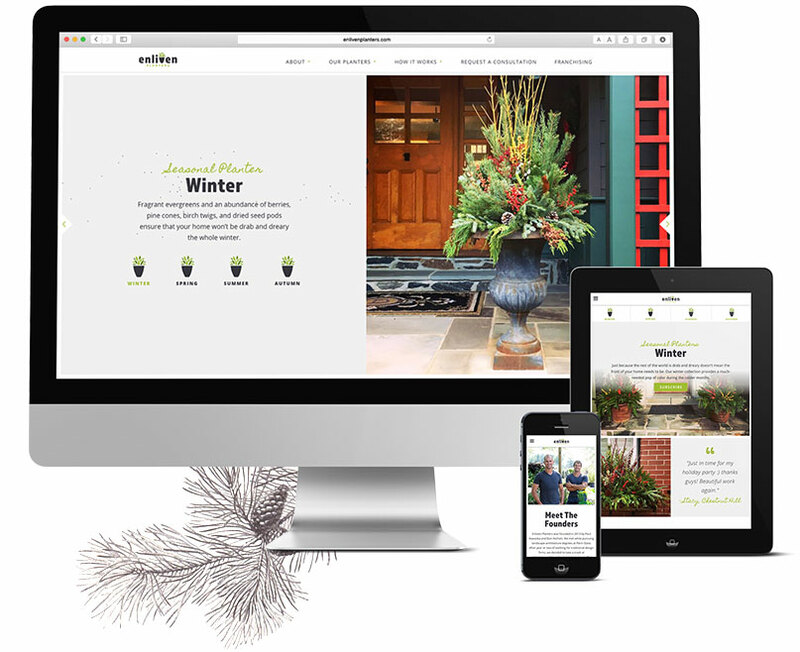 Enliven Planters is an innovative subscription gardening company that delivers quality seasonal planters and window boxes to homeowners and businesses. With a fair bit of collaboration and a lot of study, we developed Enliven's brand statements, messages, and drivers. We then commenced developing visuals that harmonized with the brand's spirit and philosophy. After we established the primary brand colors, iconography, imagery, and logo, we created the brand guidelines book. This manual defines Enliven Planters visual identity standards, details recommended messaging, and provides example mockups of how to apply the brand in a consistent manner. As we dove into web strategy, an exciting challenge surfaced. Enliven Planters provides new custom and unique planters for each season, which is a large selling point for their customers. It became evident that we needed to highlight the hassle-free and beautiful seasonal planter services. We designed Enliven's "Our Planters" page, highlighting each season with a featured image, testimonial, and a corresponding image gallery. We implemented a simple reordering plugin and customized the backend of WordPress to easily swap out imagery throughout the website as the seasons change. We wanted to focus on simplifying the “How it Works” process and make it easy and digestible for users. To limit confusion, we worked with Enliven to create a simple and straightforward 3-step process. We developed a secondary typography element to be utilized when featuring brick walls surrounded by planters or window boxes. Enliven has active social media channels and we sought to bring that forward. The integrated Instagram feed brings additional life to the site through its engagement with current and potential customers. The site acts as a portfolio for some of the beautiful work Enliven Planters has designed. To provide additional visual interest, we highlighted these images wherever possible.